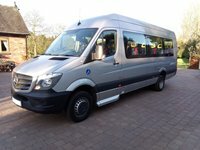 Mercedes Sprinter 17 Seat Wheelchair Accessible Minibus for Sale. 1 Leasing Company owner from new. Bus is COIF’d and can be supplied with PSV MOT if required. Supplied fully serviced, with 12 months MOT, 6 months LOLER certificate on the wheelchair lift. This Minibus would be perfectly suited to use by a Charity, Day Care Centre, Local Authority/Council, SEN School, Community Transport operator, Care, Nursing or Residential home or even for PSV. Brand new Minibuses built to the exacting specification would cost nearly £70,000 + VAT when new, so this priced at £34,995 + VAT offers excellent value for money.